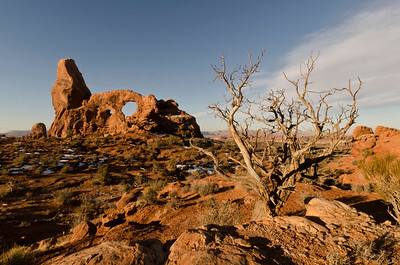 Arches National Park has so many different places and forms - all variations on a theme of red rock. 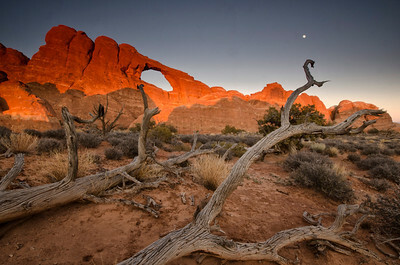 When the red rock catches the red light of dawn or dusk, the glow is amazing. We arrived at Arches NP in the afternoon and went first to Balanced Rock for the late afternoon and sunset. 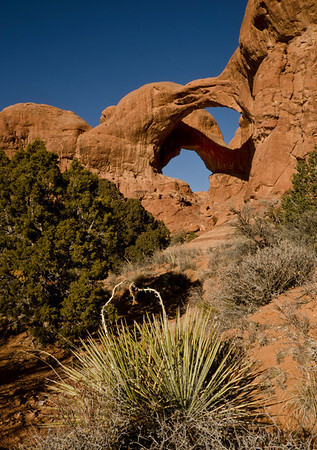 Not to be confused with Double O Arch (previous), which requires a long walk through Devil's Garden, Double Arch is just a short distance from the parking lot. It is soaring and magnificent. Three people standing beneath the arch give a sense of scale. 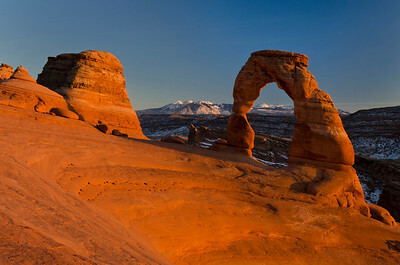 I like the repeating lines of the framing arch in the foreground, Delicate Arch itself, and the leading lines of the fins receding to the La Sal mountains. 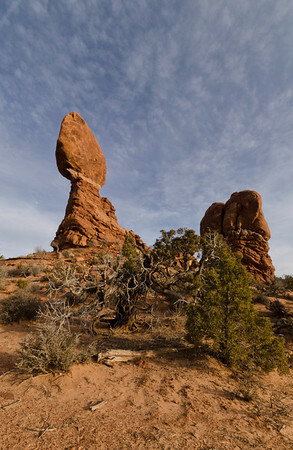 I went "behind" Balanced Rock, so as to be on its shadowed side. As the sun went down, the red light of the sunset bounced off this beautiful monolith and brought up a glow from the red red. The edge of dawn color is in the sky between the Three Gossips and the Organ just before sunrise. The moon is setting as the sun rises behind me. In the distance, the rising moon (two days before full) was above Ham's Rock, with the La Sal Mountains in the distance. The sky was full of color in all directions and the colors reflected off the rock forms. I climbed a ridge, up into the shadow of a huge monolith. The monolith's shadow threw the rocky ridge into silhouette, with the Three Gossips to the left and the Organ to the right. Our tour was planned to catch the full moon, and we took "full" advantage of it, here rising near Skyline Arch. 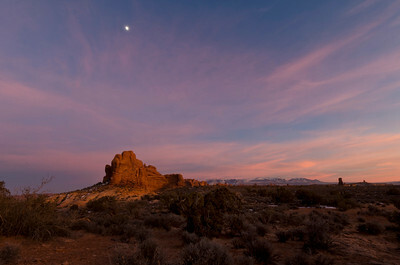 After the sun set and the redrock glow faded, most of the photographers left. Our group, plus one other person, stayed on, waiting for the sunset colors to rise in the sky. 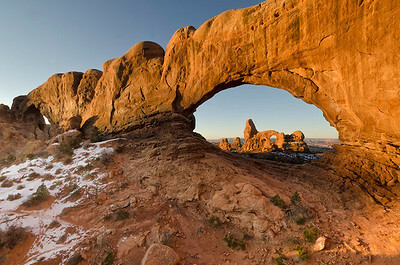 We scrambled across the rock and shot back toward the west, putting Delicate Arch into silhouette. Then more left, except for three of us, who waited until the stars were out in full. The hike back was in complete darkness except for our flashlights. Imagine three flashlight beams searching the slickrock for the next cairn marking the trail down. Looking back toward the sunset, Balanced Rock was thrown into silhouette. We hiked in the pre-dawn darkness to get to Landscape Arch before sunrise. The (nearly) full moon in Skyline Arch. 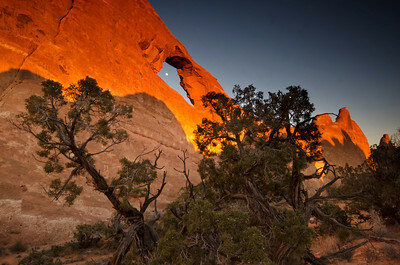 Landscape Arch illuminated by the red light of dawn. From there, we hiked on into Devil's Garden. 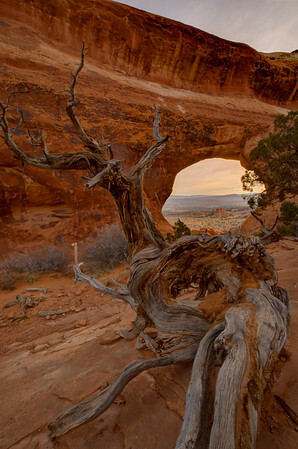 Double O Arch. From this view, the second and smaller O is completely in shade and looks black. 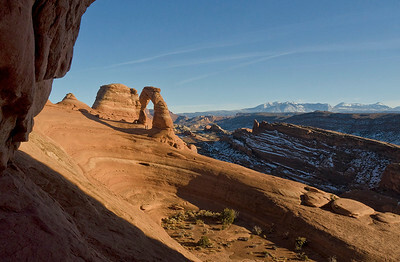 The close approach to Delicate Arch is achieved by a moderately difficult uphill hike across loose rock and slickrock. 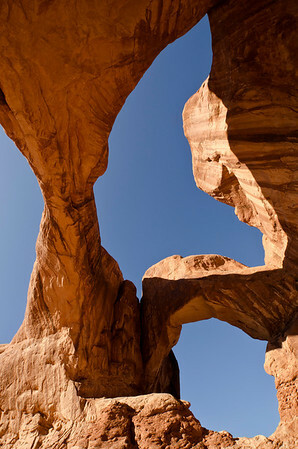 Just before you get there, the trail passes behind a sandstone wall; about twenty feet up this wall is another arch, which few people notice because it is almost overhead. 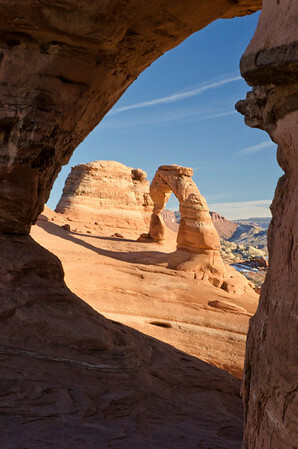 However, it is worth the short climb to catch Delicate Arch framed within the second arch.